BENTONVILLE, Ark., April 2, 2019 - Visit Bentonville announced that Aaron Mullins would become the organization&apos;s new director of communications and marketing. Mullins will coordinate and oversee all the marketing, public relations, and branding, as well as leading social media and digital communications. Aaron Mullins has over 20 years of experience as a public affairs and communications professional, in both the public and the private sector. He began his career on Capitol Hill in the U.S. Senate, working on legislative affairs for both Senator Don Nickles and Senator Elizabeth Dole. Later he served in the Department of Health and Human Services agency in Raleigh, North Carolina leading communications and marketing. Most recently, Mullins worked in corporate communications for Walmart, developing community reputation campaigns, handling crisis communications and assisting various areas of the business in communication strategies. He is a film school graduate and has owned a business writing and producing marketing and advertising video content. Mullins is a graduate of Liberty University and lives in the Bentonville area. Also, Visit Bentonville also announced the promotion of Baylea Birchfield as the organization’s new Communications Coordinator, supporting event, creative, digital and social media efforts. Birchfield is a native to Bentonville and enjoys sharing her passion for her community with locals and travelers alike. She has been with Visit Bentonville since August of 2014 and has worked in a variety of roles. Baylea is a recent graduate of The University of Arkansas and received her degree in Marketing with a minor in finance. "Aaron is the right leader for our communications team, his background in public relations and marketing will strengthen our organization. We believe his experience will elevate the Bentonville story,” said Kalene Griffith, president and CEO of Visit Bentonville. “Also, Baylea will be a great addition with her marketing knowledge and love of our community which will deepen our tourism narrative. She brings organization, efficiency, and passion for our work. We envision both of them making a huge impact on our team in promoting our city." For more information, please visit www.visitbentonville.com. 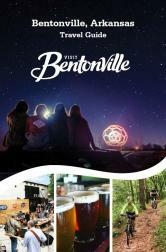 Visit Bentonville is funded by the Bentonville Advertising and Promotion Commission which was established in 1996. The Commission is supported by a 2% tax on lodging and meeting space and a 1% tax on restaurant and dining establishments. The organization&apos;s mission is to brand, promote and sell Bentonville as a tourism destination; stimulating economic development. Visit Bentonville leads the planning of sports, meetings and group tours while also marketing leisure experiences that include arts, cycling, culinary, film, music, and aviation. Visit Bentonville also collaborates with tourism offices throughout the state of Arkansas to create positive economic impact while increasing tourism amenities for both visitors and residents.